"It Seems Highly Likely that the Longer You Sit, the Higher Your Risk." with the Best Standing Desk Available Today. Standing While You Work Burns 60 Calories Per Hour! Now Select Your Ideal Desk Below! Call us now at 888 302 3375 and talk to an ergonomics expert to help you choose your ideal standing desk set-up - then our local team delivers and installs in your own home or office. 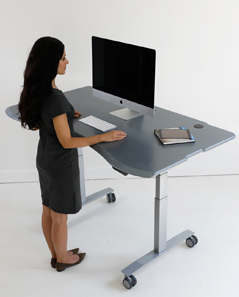 I’ve heard it’s healthier to use adjustable standing desks, but is the best standing desk on the market affordable? You’re right! There are obvious benefits to your health and wellness, as well as your productivity, when using Biomorph standing desks. As for the value, it’s important to understand that some purchases one makes are for the long term and quality office or home computer furniture is definitely one of these. Since adjustable standing desks do have moving parts, you’ll want to be sure that these parts are going to last—you need the best standing desk available. At Biomorph, even though our prices are competitive, we have sacrificed nothing in terms of the high quality of our surfaces and components – this is a purchase which will pay for itself over years of improved health and well-being. Optimal comfort, while you work! I’ll need help choosing the right size and style of desk for my needs and space. Can anyone help me with that? This is an important purchase for your home or office and it deserves to be well thought out with the help of our experts. At Biomorph, we provide our clients with dedicated customer service. The ergonomics experts at Biomorph can help you find the best solution for your needs, pricepoint and space, whether it’s a single desk or for an entire office. If you have questions right now, please engage us through live chat located at the bottom of our site, or better still, pick up the phone and call us at 888 302 3375 - our product experts will be happy to guide you through the process of selecting the standing work desk that is best for you. I’m not a rocket scientist; will I be able to set-up my desk? Assembly of your Biomorph sit to standing office desk is certainly not rocket science but as we ship the desks in a knocked-down form the desks must be assembled once delivered. However, they are designed to go together very easily—it won’t require a lot of work—and include all the tools that you need to assemble them, except for a power screwdriver that you will have to provide. Assembly instructions are included in the package and they are available online on every desk product page for download and reference. Don’t forget we are just a phone call away and will be more than happy to walk you through the process. We also offer complete installation services, available at an additional charge, that will receive the shipments, deliver to your site by appointment, assemble and install, and leave with the trash for a seamless purchase experience. What if the desk is damaged in shipping or a component doesn’t work? How about Biomorph’s warranty? What separates Biomorph from other, cheaper brands? A lot! To be fair, some of our competitors are better than others, but when it comes to quality, service and choice, we’re the best in the business. Biomorph pioneered ergonomic, adjustable furniture starting in the early 90‘s, and it’s this experience and our many satisfied customers, who range from individuals to companies large and small, and the US Government, that gives us the edge over any competition. In addition, the combination of the highest quality European components and our trademark Comfort Edges on our solid surface desktops (we don’t use plastic laminates with taped edges) creates a superior product in every way. With thousands of desks installed throughout the USA and overseas, our customers rave about how much they love our desks and keep coming back for more! I love your design and would recommend it highly! I worked at a leading computer graphics house for 10 years. One wonderful benefit of that experience was the exposure and use of your Biomorph Desk systems! I bought one of your 'Multi' desks several years ago. Maybe 3 years by now, I am not sure but time is flying by. I just wanted to follow up and tell you that I think it is a really great desk!!! So long as I remember to take advantage off all the options, I find that I am feeling better working at my desk. I am standing right now as I write this e-mail and my back loves me for it! The craftsmanship is holding up very well. The desk is aesthetically pleasing and functional, I recommend it very much. Just wanted to share this with you. The desk frame and tops arrived last week and we were able to assemble the unit without any issue. Excellent packing job, by the way. The amount of care that was taken to ensure that everything arrived undamaged was very obvious. Thank you! Again, great job on the shipping of the products. I love the desk and chair and I already feel an incremental increase in productivity of 60%. :-). Click Here Now to Select Your Ideal Desk!